Updated March 7, 2011: I discovered you can also install the same scripts into Chrome. Chrome supports user scripting without the need for Greasemonkey. Today I discovered 2 scripts for Salesforce.com that make administering Salesforce.com just a little easier. The first removes the click needed to display the menu that is displayed under your name. Most commonly used when you want to go to the Setup screen. 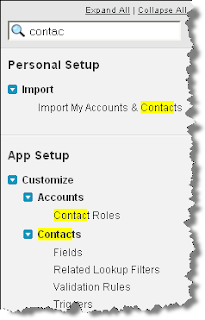 With Salesforce.com Setup and Apps Hover Links, by just hovering over your name, the menu expands. It's simple, but quite nice. At the beginning of 2010, I made some tech predictions as well as discussed some other technology issues. Here I will summarize how well I did with my predictions. In a nutshell, most did not come to pass, but the issues remain, so you could say I was just early. Back in Windows XP, I found it easy to recover a window that the Title Bar was off the screen. When this occurred in Windows 7, I was surprised to find the same trick didn't work (right-click the icon in the Task bar, select Move, and use the arrow keys to grab and move the window). In Windows 7, it's not difficult, just different. Select the program in the Task Bar.Hold the Windows key and press an arrow key.Repeat the arrow key movement as necessary.The Windows key + arrow key offers other interesting options even with fully visible windows. Try Windows key + right or left arrow to get the window to take 1/2 of the screen. Use Windows key + up or down arrow to maximize or minimize, respectively, the window.